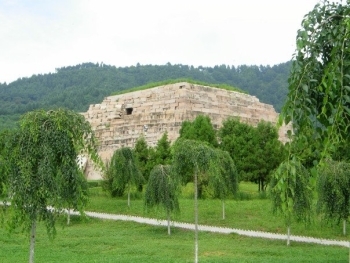 The "Capital Cities and Tombs of the Ancient Koguryo Kingdom" consists of three former capitals and 40 tombs. These archaeological sites represent the extinct Koguryu civilization that existed from the 1st century BC until the 7th century AD in what is now Northeast China and North Korea. The cities are the first capitals of the Koguryo Kingdom, Wunu Mountain City and Guonei City, and Wandu Mountain City. Of the thousands known Koguryo tombs, the designated area includes 14 Imperial Tombs and 26 tombs of Nobles. The latter are decorated with wall paintings, describing daily life scenes. This WHS is closely related to Koguryu Tombs in the Democratic People's Republic of Korea. The tombs there belong to a later period of the Koguryu Kingdom. Both China and North Korea have been asked to join their Koguryan sites, but haven't taken action to accomplish this so far. Koguryo Kingdom covers the sites on the Chinese side of the border. There is a separate, identical inscription for the DPRK which will probably never merge. I visited this place a couple of years ago in winter. Not the best place to visit in winter but it was a lovely sunny day. My main plan was to continue north to Harbin for the ice festival so it "had" to be winter. Arriving by train I rented a taxi for the day. The driver knew all locations well. You buy a ticket for 4 attractions although I don't remember getting checked for the tombs and the mountain city, maybe the driver just let someone know I have a ticket while I was away. The first one is the Haotai Stele where a guide was explaining the stele with another group of tourists. It is inside a building with large glass windows. It was built in AD 414 and describes the founding of the Koguryo Kingdom. There is a lot of information about the stele online I don't wish to repeat, but looking into it is certainly an interesting and long (very long) read. Next stop is the Jiangjunfen Tomb and surrounded by several of the general's subordinates. There is not much to see but walk around the square structure. Impressive tomb nonetheless, sometimes referred to as the Pyramid of the East for good reason. Here I was also stopped by what I'm quite are fake policemen pretending to look for illegal immigrants - as if they would be hanging around at the tombs...(tip: don't show anyone your passport or ID if they don't wear a proper uniform). Third stop is the Nobelmen's Cemetery at Yushan. The tomb have some neat wall paintings inside as well and are thus only opened when visitors arrive. You need the guide to use the flashlight anyway. Last and probably best of all four is the Wandu Mountain city, now in ruins, but the location of the city surrounded by steep mountains is ingenious, with the nearby valley providing enough expansion and farm land to feed the city. I really like it. There are also walls (newly built?) going up along both sides of the mountain. I climbed up the right side almost all the way to the top for an amazing view. The snow made it a little difficult but totally worth it (besides, it doesn't feel like real snow if you have spent a winter in Canada!). I took a breather at the top, obviously took a lot more pics, it makes you think how they picked this nice place for a city and what happened to it. Going down is tougher in the snow. The taxi driver then wondered why I took so long and didn't just "look around a little" and demanded another 100RMB...any excuse to demand extra cash but that doesn't fly with me. Back to the train station for the originally negotiated price it was. Including my hike I spent maybe 3h in total for all sites. I have been to this WHS in 2008. Koguryo kindom was not an empire since its kings were always authorised by Chinese emperors. The most visitable place is Ji'an, Jilin province. Besides of some ancient ruins, you can see a big stele "Haotaiwangbei", which is famous for its Chinese calligraphy. Wukuifen is an ancient tomb with many mural showing how ancient Chinese understand the universe, the Chinese legendary emperor Fuxi and Shennong was pictured on the wall. Stelae: The stele of King Gwanggaeto of Goguryeo was erected in 414 by King Jangsu as a memorial to his deceased father. It is carved out of a single mass of granite, stands nearly 7 meters tall and has a girth of almost 4 meters. The inscription is written exclusively in Classical Chinese and has 1802 characters. Recommended for combination by AB: With DPRK Tombs: Both were requested by AB AND WHC to consider combining later - "Encourages the Chinese authorities and the authorities of the Democratic People's Republic of Korea to consider the possibility of a future joint, transboundary nomination of the Koguryan culture." Controversial at inscription: (1) there were some issues concerning the whitewashing of the facts in relation to chinese and korean histories; (2) the korean press accused the chinese of political maneuvering in order to get the dprk's own koguryo nomination deferred so that its own koguryo site will have a greater chance of getting inscribed. ironically, both were inscribed on the list in 2004, and the committee even recommended that a transfrontier site be formed.